If you like Peter Pan, or if you love funny, fantastic middle grade fiction, I highly recommend you read this series. This is a reread for me, and the books are as delightful the second time through as they were the first. My daughter claims them as her all-time favorites. 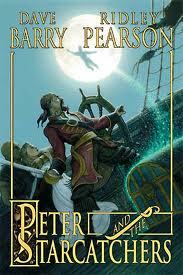 This series is where you get all your questions about Peter Pan answered. How did Peter and Hook become enemies? How’d they get to Neverland? Where’d the Lost Boys come from? Why does Peter fly and never grow older? What exactly happened between Hook and the giant crocodile? How did pirates become stranded on the island? Where do mermaids come from? And how did Peter and Tinkerbell hook up? All three books take place before the classic story, and they are more fun and adventurous than the original! In Peter and the Starcatchers, Peter is a London orphan set onboard a ship with four other boys, all of them sold as servants to a far off kingdom. Little does Peter suspect, however, that he’s been dropped in the middle of the desperate conflict. For a large quantity of stardust has recently fallen to earth. It’s a highly magical substance that has caused great turmoil throughout earth’s history, so a secret organization called the Starcatchers has dedicated themselves to rid the planet of it, but there are Others who want the power for themselves. Unbeknownst to Peter, the stardust is on the very same ship. This is a fabulous sea adventure between forces of good and evil. There’s a storm at sea, pirates, a battle, a marooning, savages, mermaids, five friends, and a courageous young girl named Molly. (Not Wendy, but remember this is a prequel, so we can make a very good guess as to who Molly is.) Now let me tell you something about the humor. I can only imagine how much fun Mr. Barry and Mr. Pearson had thinking up some of the stuff in here. For example, Black Stache (the pirate captain) has a secret weapon that makes his ship faster than all others—large, billowing sails fashioned like a lady’s brazier that can be strung up during a chase! (Stache is convinced they’re going to “revolutionize the pirate industry.”) These guys come up fabulous, kid-pleasing details and the most hilarious dialogue. In conclusion, this is one is vastly entertaining and clever. Everything eventually makes complete sense in regards to the original Peter Pan story (Peter and Wendy–the Kindle book is free! ), and it makes you wonder why Mr. Barrie (the original author) didn’t come up with this one first. There is some mild violence. Pirates are always tossing people overboard and such, but it’s quite unrealistic. And there are two mild profanities. The book claims readers 10 and up, and I’d agree with that. I’ve recently (and happily) learned that Disney is in the earliest stages of producing a movie version of this book. It’s already a Broadway play that opened in March and received 9 Tony Award nominations. I’m eager to see what Disney does with it! “Rundoon” is the third one. I just finished it again, too. I’m waiting for the fourth one, “Sword of Mercy,” I think it’s called. It’s one that has been released since I read the first three in the series a few years ago, so I’m excited for my first read-through. Both of my kids have loved each in this series! My daughter adores this series and (at 18) still rereads it from time to time. I attended an author talk by Ridley Pearson a few years ago, and was impressed with his knowledge and his kindness. Oh, I absolutely adore these books! I read the first three but not the fourth one yet (Sword of Mercy). Dave Barry and Ridley Pearson came to the bookstore where I work when the third book was released. Needless to say they were hilarious and entertaining! How lucky! They seem to be quite the pair. For a year now, this book comes up periodically for me. I really need to read it. Your review leads me to believe my son might like it too. I am going to check it out. Thanks. My students love this series! I can see why! Thanks for stopping by, Jasmine!